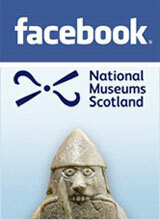 The ‘Across the floor’ programme at National Museums Scotland encourages staff to spend a day with another department, to find out more about what that department does and learn from their working practices. Having worked in maintenance engineering for over thirty years, I was keen to learn more about Engineering Conservation. Coming from a manufacturing background, I was interested in finding out more about the difference between our working environments. Working as a support assistant I am regularly involved in transporting artefacts and objects, so I looked upon this as an opportunity to further my knowledge of Collections Services. I have a particular interest in clocks and was delighted to find out I would be working with the Tod Head lighthouse, which is clockwork driven. 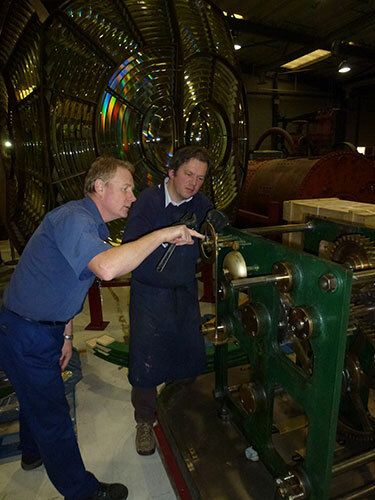 This first-order dioptric flashing light was presented to the Museum by the Northern Lighthouse Board and is being reassembled at the National Museums Collection Centre. It was designed by Messrs Stevenson, civil engineers, of Edinburgh, with the optics constructed by Henry-Lapaute of Paris. The optics are very different from any others we have in the National Museums Scotland collection, such as those from Eilean Glas and Inchkeith and the Tay leading light, made by the Chance Brothers of Birmingham, or Sule Skerry’s optics, which were made by Barbier et Bernard of Paris. 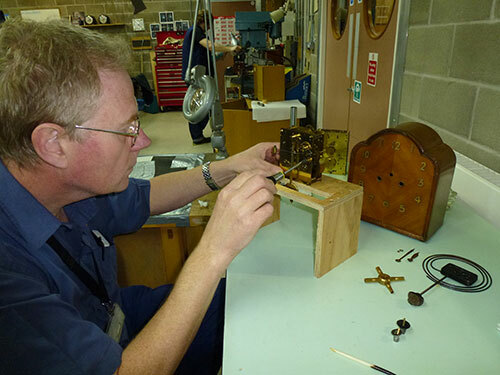 Working alongside Darren Cox at the Collection Centre, I was occupied cleaning and identifying various parts of the clockwork mechanism in preparation for reassembly. I found it really interesting that a lighthouse lamp could be clockwork driven, although the fact that it had to be wound up every half an hour seems impractical! Working on the Tod Head lighthouse mechanism. I also spent time working on a pendulum clock movement. Darren dismantled the movement, pointing out the various parts and explaining their function. I was then given the task of assembling the clock movement. After successfully achieving this, I then proceeded to dismantle and assemble the clock once more to familiarise myself with this practice. Working on a pendulum clock. I thoroughly enjoyed my Across the floor day with Engineering Conservation and appreciated the insight into their work. After this experience, I would welcome the opportunity to work directly with the Engineering Conservation team in the future. Interested in the workings of clocks and lighthouse mechanisms? See the Ritchie clock, Millennium Clock and Midsummer Chronophage and two lighthouses lenses from our collection in the Grand Gallery and Discoveries gallery at National Museum of Scotland.